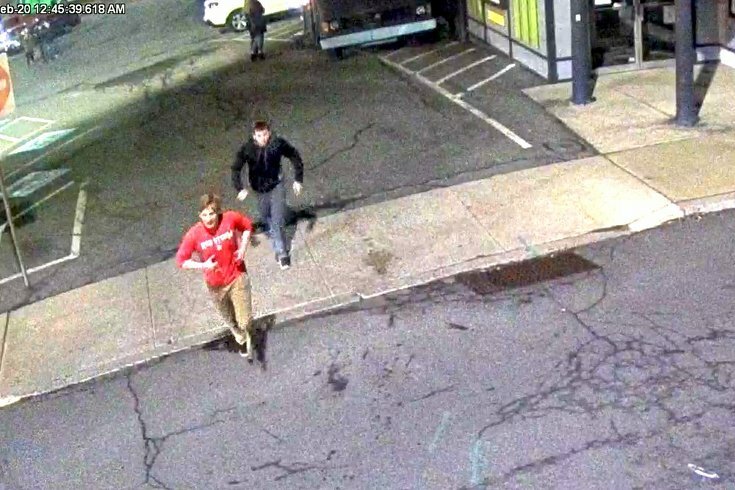 These men are two of three suspects sought by police in connection with stabbing at Kutztown University. Authorities are searching for three suspects they say may have been involved in a stabbing at Kutztown University. The Borough of Kutztown Police Department said on their Twitter page Saturday that they "need to talk" to three people involved in the stabbing of a student. Police released photos and a video of the three male suspects, adding that they are searching for the knife used in the attack. The university said in a safety alert that the victim was a 22-year-old student who was taken to Lehigh Valley Hospital where he is in serious condition. Officials believe at least one of the suspects is a Kutztown student. Authorities do not know who committed the stabbing at this time. Anyone with information is asked to call the police at 610-683-3545.